An artist's concept showing NASA's Curiosity Mars rover streaking through space. Curiosity launched on Nov. 26, 2011 and is slated to land on the Red Planet in August 2012. NASA's new Mars rover has already begun performing research in space, less than three weeks after launching on its eight-month cruise to the Red Planet. The car-size Curiosity rover has begun using its Radiation Assessment Detector (RAD) instrument, which monitors high-energy particles from the sun, distant supernovas and other sources. Such radiation is potentially hazardous to humans, so the rover's results could help scientists plan future manned missions to Mars, researchers said. "RAD is serving as a proxy for an astronaut inside a spacecraft on the way to Mars," Don Hassler, RAD's principal investigator from the Southwest Research Institute in Boulder, Colo., said in a statement. "The instrument is deep inside the spacecraft, the way an astronaut would be. Understanding the effects of the spacecraft on the radiation field will be valuable in designing craft for astronauts to travel to Mars." The 1-ton rover's chief aim is to gauge whether the Gale Crater area can, or ever could, support microbial life. Most of Curiosity's 10 different science instruments are built to help the rover answer this question. RAD will also help assess Martian habitability. However, the toaster-size instrument was designed specifically to prepare for future human exploration of Mars. Its measurements will help scientists calculate the radiation dose astronauts would receive on the surface of the Red Planet, researchers said. But future Martian explorers would also be exposed to radiation during their long journey to the Red Planet, so mission scientists have turned RAD on in deep space. Scientists have measured space radiation before, but previous observations were made with instruments at or near the surface of spacecraft, researchers said. But RAD is on Curiosity's body, buried inside the MSL spacecraft. It's therefore shielded by various components, including the mission's protective aeroshell. So RAD's measurements should be a closer approximation of the doses astronauts would receive on their trek to Mars, researchers said. The RAD observations mark the beginning of Curiosity's science work, which will really take off when the rover lands on Mars next August. "While Curiosity will not look for signs of life on Mars, what it might find could be a game-changer about the origin and evolution of life on Earth and elsewhere in the universe," said Doug McCuistion, director of NASA's Mars Exploration Program. "One thing is certain: The rover's discoveries will provide critical data that will impact human and robotic planning and research for decades." As of Wednesday morning (Dec. 14), Curiosity had covered about 31.9 million miles (51.3 million kilometers) on its 352-million-mile (567-million-km) flight to Mars. 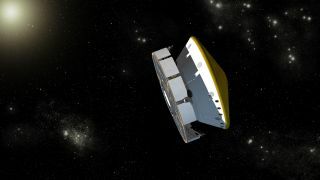 The mission's first trajectory-correction maneuver is slated for mid-January, officials said.